Everything is interconnected. Everything affects everything else. Everything that is, is because other things are. What is happening now is part of what happened before, and is part of what will happen next. This is the teaching of Dependent Origination. It may seem confusing at first, but it is an essential teaching of Buddhism. This teaching has many names. It can be called Interdependent Origination, (Inter)dependent Arising, Co-Arising, Conditioned Genesis or Causal Nexus along with many other names. The Sanskrit term is Pratitya-Samut Pada. The corresponding Pali word can be spelled Panicca-samuppada, Paticca-samuppada, and Patichcha-samuppada. Whatever it is called, Dependent Origination is a core teaching of all schools of Buddhism. No beings or phenomena exist independently of other beings and phenomena. This is especially true for the illusion of Self. All beings and phenomena are caused to exist by other beings and phenomena, and are dependent on them. Further, the beings and phenomena thus caused to exist also cause other beings and phenomena to exist. Things and beings perpetually arise and perpetually cease because other things and beings perpetually arise and perpetually cease. All this arising and being and ceasing occurs in one vast field or nexus of beingness. And there we are. In Buddhism, unlike other religious philosophies, there is no teaching of a First Cause. How all this arising and ceasing began—or even if it had a beginning—is not discussed, contemplated or explained. The Buddha emphasized understanding the nature of things as-they-are rather than speculating on what might have happened in the past or what might happen in the future. Things are the way they are because they are conditioned by other things. You are conditioned by other people and phenomena. Other people and phenomena are conditioned by you. When this is not, that is not. Dependent Origination is, of course, related to the doctrine of Anatman. According to this doctrine, there is no "self" in the sense of a permanent, integral, autonomous being within an individual existence. What we think of as our self—our personality and ego—are temporary constructs of the skandhas—form, sensation, perception, mental formations, and consciousness. So this is what "you" are—an assembly of phenomena that is the basis for the illusion of a permanent "you" separate and distinct from everything else. These phenomena (form, sensation, etc.) were caused to arise and assemble in a certain way because of other phenomena. These same phenomena are perpetually causing other phenomena to arise. Eventually, they will be caused to cease. A very little self-observation can demonstrate the fluid nature of self. The self you are in a workplace, for example, is a very different self than the one that is parent to your children, or the one that socializes with friends, or the one that partners with a spouse. And the self you are today may well be a different self than the one you are tomorrow, when your mood is different or you find yourself with a headache or have just won the lottery. Indeed, there is no single self to be found anywhere—only various aggregates appearing in the moment and which depend on other phenomena. Everything in this phenomenal world, including our "self," is, anicca (impermanent) and anatta (without individual essence; egoless). If this fact causes dukkha (suffering or dissatisfaction), it is because we are unable to realize the ultimate reality of it. Put another way, "you" are a phenomenon in much the same way a wave is a phenomenon of ocean. A wave is ocean. Although a wave is a distinct phenomenon, it cannot be separated from ocean. When conditions such as winds or tides cause a wave, nothing is added to ocean. When the activity of wave ceases, nothing is taken away from the ocean. It appears in the moment because of causes, and disappears because of other causes. The principle of Dependent Origination teaches that we, and all things, are wave/ocean. "Once we appreciate that fundamental disparity between appearance and reality, we gain a certain insight into the way our emotions work, and how we react to events and objects. Underlying the strong emotional responses we have to situations, we see that there is an assumption that some kind of independently existing reality exists out there. In this way, we develop an insight into the various functions of the mind and the different levels of consciousness within us. We also grow to understand that although certain types of mental or emotional states seem so real, and although objects appear to be so vivid, in reality they are mere illusions. They do not really exist in the way we think they do." The teaching of Dependent Origination is related to many other teachings, including that of karma and rebirth. Understanding of Dependent Origination is therefore essential to understanding almost everything about Buddhism. There are vast numbers of teachings and commentaries on how Dependent Origination works. The most basic understanding usually begins with the Twelve Links, which are said to describe a chain of causes that lead to other causes. It is important to understand that the links form a circle; there is no first link. The twelve links are ignorance; volitional formations; consciousness; mind/body; senses and sense objects; the contact between sense organs, sense objects, and consciousness; feelings; craving; attachment; coming to be; birth; and old age and death. 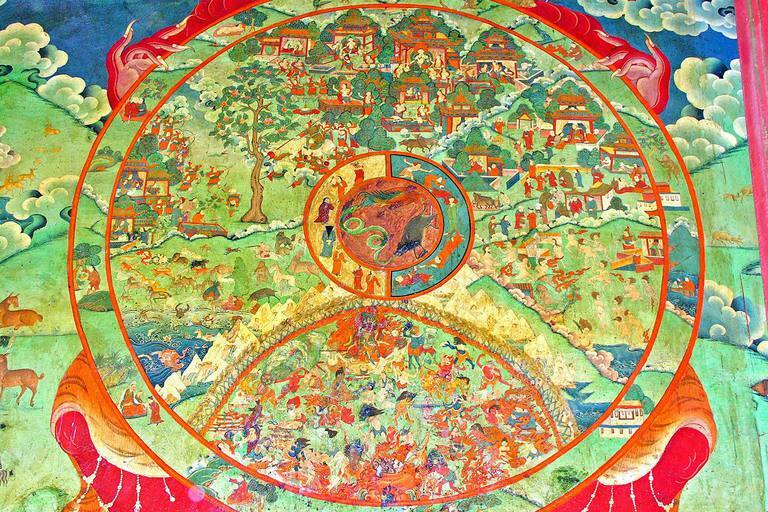 The twelve links are illustrated in the outer rim of the Bhavachakra (Wheel of Life), a symbolic representation of the cycle of samsara, often found on the walls of Tibetan temples and monasteries.